En mycket bra upplagd 12-timmars rundtur.Trevlig guide/chaufför som var både rolig och informativ.Besökte Highlands,Whiskeydestilleri och fick en hel del historia berättat för oss. Åkte en tur med båt på Loch Ness.Riktigt trevligt-kan rekommenderas. Had a great time with our driver, John, and on the Hairy Coo bus. 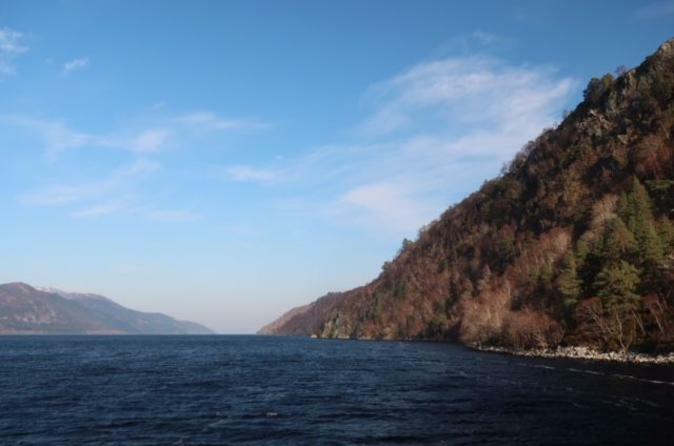 We got to seethe beautiful highlands and Loch Ness. The fish and chip place at Lock Ness is great. Deanston Distillery smelled terrible and had terrible whisky, but was a good stop anyway to see the process. Don't buy the pre ordered sack lunch at the distillery, buy the daily soup and sandwich instead. Incredible! The tour guide was so informative and friendly and knew so much about Scottish history. The Highlands were breathtaking, was really the highlight of our trip to Scotland. It was nice, I liked the tour and boat ride but there are little options for lunch if you want to do the boat ride. My friends and I had a lot of fun aboard the Hairy Coo Bus! Our tour guide, John, was very knowledgable and punctuated the ride with humorous, vivid, and detailed anecdotes about Scottish history and the sites we were seeing from the bus window. In between the storytelling, he played a custom playlist of Scottish artists, and sometimes included fun facts about the songs and artists we were hearing. The bus was not crowded which made it so that everyone was able to have a window seat and really enjoy the incredible scenery. After passing the massive Kelpie statues and the birthplace of Mary Queen of Scots, we made our first stop at Deanston Distillery, which is in a pretty riverside location. On the tour, they showed us their massive mash tun, one of the only uncovered ones still in operation, where you could see giant agitators circulating the mash. We learned about the history of the distillery building, which was once a cotton mill, and more recently served as the setting for the film The Angel's Share. For 10, we got to taste two drams of whisky before getting back on the bus and driving to the Highlands. John warned us that we were about to cross the invisible line into the Highlands, but we had no idea that the scenery would change dramatically almost instantly. Suddenly there were snow-capped peaks and dramatic green valleys. We stopped to take pictures at Glen Coe, which is breathtakingly beautiful and was also extremely windy. We drove through Fort William, with great views of Ben Nevis, and past a series of majestic lochs, finally arriving at Fort Augustus, the quaint town at the base of Loch Ness. For 13, we were able to purchase tickets to cruise Loch Ness. The hour-long journey was aboard a boat with a small cafe counter where you could purchase snacks, tea, and beer. There was a roof deck with beautiful views of the loch and we saw mountain goats and deer walking on the steep hillside. Back inside on the lower level of the boat, one of the guides explained the sonar screens, where you can see the contours of the loch floor, more than 600 feet below. After the boat cruise, we had a little time to explore Fort Augustus and get a snack before boarding the bus and making a brief stop at the Commando Memorial, a striking WWI monument with stunning views of the Nevis Range all around. Our drive home took us through the Cairngorms, a national park with truly otherworldly scenery. A bubblegum-hued sunset descended, one of the most beautiful I have ever seen, as we learned about the history of the sites we passed, including Blair Castle and the Dalwhinnie Distillery. We made a brief stop in a small town called Pitlochry on the way back, where we were able to enjoy a local delight, Aberfeldy tablet. We arrived back in Edinburgh around 8:30 p.m. It was a long day but I felt like I truly got to see the greatest hits of the Highlands. If you are short on time, this is a great way to see the major sites in a day trip. One thing you should be aware of is that there is no bathroom on the bus, so plan accordingly there were well-spaced bathroom stops, which was appreciated!. 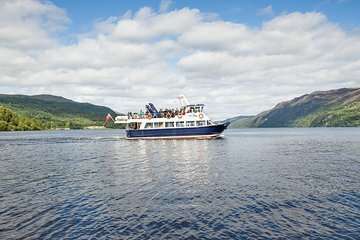 Tour was perfectly crafted, it even provided special deal for boating on Loch Ness. Driver guide was very knowledgable and very helpful. Only think I was concerned about was the accent of driver. It was too scottish for me. I wasn't able to understand some parts of his amazing stories.